Vonovia is the largest listed landlord in Germany, focused on the residential market. It has good fundamentals and the support of a strong real estate market in Germany, where exists a tight supply-demand situation. Vonovia’s good growth prospects and attractive dividend yield make it an interesting income play within the European real estate market. Vonovia SE (OTCPK:VONOY) offers a great combination of growth and income, due to its business prospects in the German residential market and its internationalization strategy, while its dividend yield is also attractive for income-oriented investors. Vonovia is one of the largest real estate companies In Europe, after Unibail-Rodamco-Westfield (OTCPK:UNRDY) or Klépierre (OTCPK:KLPEF), being mainly focused on the German residential market. Its core business is the development and management of residential real estate to customers throughout Germany and some international markets. Its closest peers are other German real estate companies dedicated to the residential market, such as Deutsche Wohnen (OTCPK:DTCWY) or LEG Immobilien (OTC:LGMMY). Vonovia has been listed since 2013, and its market capitalization is about €24 billion nowadays ($27 billion). Investors should note that even though Vonovia trades in the U.S. on the over-the-counter market, it has much more liquidity in its primary listing in Frankfurt. For a more detailed analysis of the Vonovia’s business profile, take a look at my previous article on the company. Vonovia is the largest landlord in Germany and has grown mainly through acquisitions. At the end of 2018, it owned some 480,000 apartments, of which around 90% are located in Germany. Its portfolio value was around €44 billion ($49.7 billion) at the end of last year, an increase of 5.3% from the previous year. Vonovia has a very good growth history as the company benefits from strong fundamentals in the German real estate market. Housing prices have been supported by strong GDP growth, a relatively low unemployment rate, the inflow of migrants to the country and a tight supply-demand situation in the housing segment over the past few years. As the company focuses mainly on multifamily homes for medium and smaller income households, Vonovia’s business model benefited greatly from these tailwinds, and the value of its assets has grown at mid-single-digit growth rates over the past five years. Going forward, Vonovia has good growth prospects as the company is well positioned to benefit from megatrends, like urbanization and demographic change, while another growth venue is its recent strategy of replicating its successful business model in foreign markets. For many years, Vonovia’s operations were totally developed in Germany, while more recently, it decided to start its internationalization process. Even though Germany is expected to remain the dominant market within its asset portfolio, Vonovia wants to grow in residential markets outside of Germany and is currently present in Sweden and Denmark. This should enable the company to further diversify its portfolio geographically and invest in the cities which have better growth prospects over the long term. This should help it to continue driving rents and valuation growth in the next few years, as demand for affordable housing is expected to remain strong in all of its markets. Regarding its financial performance, Vonovia has reported good numbers over the past few years, supported by a positive economic cycle in Germany and the tight situation between supply and demand in the real estate market. In 2018, Vonovia maintained a solid operating momentum, achieving good top-line and asset value growth rates. Its portfolio value increased 13% in the year, mainly due to rising property values in Germany, even though the total number of residential units decreased by 3.2% due to its strategy of portfolio optimization and disposal of low yielding units. Showing that Vonovia has an active portfolio management approach, despite the decrease in residential units, its total rental income increased by 0.7% in the past year, leading to a higher revenue per unit on average. This improved operating efficiency is also achieved on the cost side, with operating expenses declining by 12% in 2018. This strong cost reduction is possible to achieve due to Vonovia’s business model of standardization across units and improving operational efficiency by internalizing most activities and avoiding the middlemen, which led over recent years to much lower cost per unit. 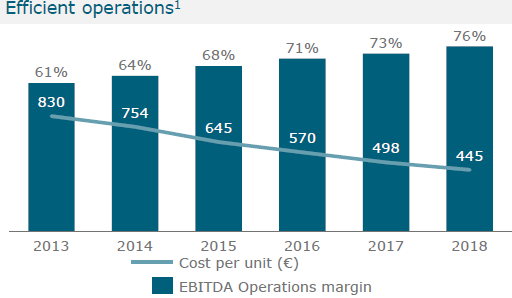 This improved efficiency is visible in the company’s EBITDA margins, which have improved from 61% in 2013 to the highest level in Vonovia’s history at 76% in 2018. Vonovia has nowadays the most efficient operations within the German residential market, thus further cost improvements may be difficult to achieve. Nevertheless, the company continues to invest in energy-efficiency and standardization of its residential portfolio, thus cost cutting should continue to be a supportive factor for earnings and cash flow growth in the near future. The combination of revenue growth and improved efficiency led naturally to higher free funds from operations (FFO), the key measure of profitability for real estate companies, in the past year. Vonovia’s FFO increased by 9.8% to more than €1 billion ($1.12 billion), a significantly higher growth rate than EBITDA due to lower interest expenses and taxes. Going forward, Vonovia is expected to maintain a solid growth path, given that its guidance is for rental growth to be around 4.4% and FFO to grow between 7% and 12% in 2019. This is supported by strong fundamentals in the real estate markets across its geographies, but also by its development program in modernization and new construction of more than €1.3 billion ($1.47 billion) expected in 2019. Therefore, its guidance seems to be easily achievable, and Vonovia can even beat expectations, with the major risk being mainly from a sharp macroeconomic slowdown in Germany that may lead to lower demand for housing in the next few months. Regarding Vonovia’s balance sheet strength, the best measure for real estate companies is the loan-to-value ratio (LTV), given that assets have a long-term nature and therefore are usually financed to a large extent by debt. 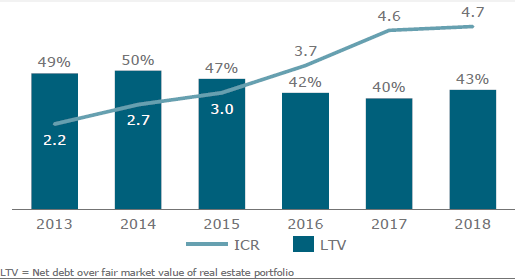 Vonovia’s LTV ratio was 43% at the end of 2018, in line with its medium-term target of 40-45%. This level is acceptable within the real estate sector and shows that Vonovia is not overly leveraged and therefore does not need to reduce debt in the coming years. 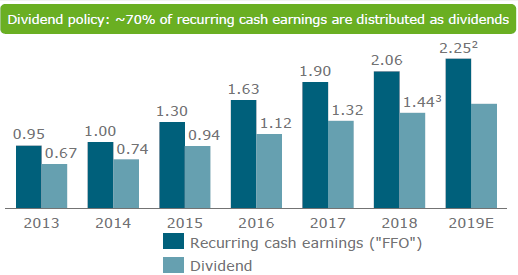 Moreover, due to a higher cash flow generation and lower cost of debt, its interest coverage ratio (ICR) has improved significantly over the past few years, thus its financial profile seems sound, and this is an important support for an attractive shareholder remuneration policy. Indeed, the company has a good dividend history since its IPO in 2013, delivering a rising dividend over the years supported by its organic cash flow generation. Related to its 2018 earnings, Vonovia increased its dividend per share to €1.44 ($1.63), an increase of 8.3% from the previous year. At its current share price, the company offers a dividend yield of about 3.2%, which is interesting for a growing company like Vonovia. Please note that like many European companies, Vonovia only distributes one dividend per year, and the next payment is expected on next May 20. Additionally, the German dividend withholding tax rate is 15%, reducing a little the income appeal. Regarding the dividend sustainability, the best metric is the FFO payout rate, which has been on average about 70% since 2013, in line with its medium-term goal. This level seems to be acceptable for a company with a highly recurring revenue stream, which is improving efficiency and has a solid financial position, thus I see the dividend as well covered and is likely to remain on a gradually rising path in the coming years. Within the European real estate market, Vonovia is a good play because it offers a great combination of growth and income that is sustainable over the medium to long term due to the strong fundamentals and recurring nature of the residential market. Moreover, its valuation is quite undemanding considering its fundamentals, given that Vonovia is trading at a multiple close to its net asset value, while a premium valuation seems warranted by its good profitability and growth profile. Therefore, a re-rating may happen in the coming months, making it attractive for income investors both from an income and upside potential perspective. If you like my work and are looking for help to invest in the financial sector, you should try Financials Alpha Portfolio. I’m a specialized portfolio manager on Financials and offer two Long/Short portfolios (US and Europe) using my investment approach. Returns have been above the respective sector since inception, helping investors to improve returns in this difficult sector. I’m currently offering a two-week free trial, so you can see at no risk if Financials Alpha Portfolio helps you manage your own portoflio.